I’ve been in the world of innovation for some years now. Most of my time has been spent with great companies who have been looking to their employees, customers and partners for ideas that can help them transform their businesses. Capturing these ideas takes a combination of consulting, design and communication skills. Whilst this is a challenge in itself, the harder part is typically in the execution. Designing these paths to execution can sometimes be a fairly straightforward affair, as they already exist and are aligned to the ideas being collected. This is fabulous when it happens. We get great conversion rates, success stories and ROI’s to report. Sometimes these structures need to be designed to ensure the ideas are realised and not lost in a PR exercise or Change Management Initiative. Communities need their ideas treating with respect, which usually means implementing them and of course reporting back on their success. Typically TBCM ideas are executed by a pre-assigned project management team that are assigned by the strategic sponsor of the challenge. Conversely, CI and SB ideas are executed by predefined teams in the areas of the business they impact or where possible by the individuals who raised them. These models are fairly common in organisations that have been undertaking idea management for several years. However a new model has been emerging, along side these, as companies are looking to extract more value from their communities. This requirement has been born out of two needs. The first, is the need to extract more value from their communities. The second, has been around innovating new to world ideas. This has resulted in a shift towards creating Dragons Den or Shark Tank (for my American cousins) processes for taking ideas that can’t be implemented by individuals or the teams created to realise their value from CI & SB engagement models, usually because they require resources beyond their capacity to access, which Dragons can. These Dragons are made up of Senior Management who have access to discretionary budgets and resources. Like their TV counterparts, they sit together on a regular basis and listen to business propositions that they can invest in. These Dragons are looking for ideas that can either significantly improve something within their business areas or have the potential to disrupt their marketplace. Whilst the first need is obvious, the second is often one of those things that keeps Senior Management awake at night. The fear of missing the next big idea that would add millions to their P&L or worse still, being second or third to market to a strong competitor does not bear thinking about. Whilst SB and CI engagement models create the possibility of capturing the next big idea, the team and individual execution models typically lack the significant resources to execute them. This is why we need the Dragons Den execution model. Usually in the early life of SB and CI engagement models a Senior Manager or CxO will perform the function of the Dragon by plucking ideas of high potential from the IDM system and executing them. However, as time goes by, the manager moves on or looses focus on performing this role, as it was only ever an informal one. So to formalise and continue its success we need to build our Dens and bring together our Dragons. There are many pitfalls in this process and they need to be carefully managed. Dragons can sometimes be fluffy creatures (all smoke and no fire) and don’t want to invest, even if the business proposition is the best thing their business has seen in years. Ideas can also be presented too early and haven’t been matured into sufficient business proposals with Business Angel support. There are also huge gains to be had. Firstly, those bigger ideas can be realised. Secondly new to market, disruptive offerings don’t slip through the corporate fingers. Like their TV counterparts, they can not only bid against each other to take on an idea they can also combine to take them forward together. Thus creating even bigger or faster returns on ideas and making sure the right Dragon takes them on. Finally, if a Dragon moves on to new pastures or wants a break from the process, a new Dragon can be found, which improves on the informal Senior Managers seasonality. Interestingly Dragons Dens aren’t the virtue of the SB & CI engagement models. They have also emerged in the TBCM. This has seen Venture Capitalist (VC) teams in businesses sponsoring new product/service and business model challenges that look to generate significant new lines of revenue. These challenges usually take the form of Innovation Tournaments, with significant rewards, multiple engagement stages and game mechanics. But that’s another post. 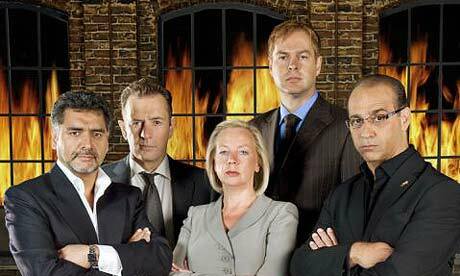 So, Dragons Dens are a vital component of any maturing Idea Management and Innovation Program. Whether they are born from the need to stabilise the informal process, increase the value from communities or ensure the next big thing isn’t missed, they need to be designed with intent, purpose and carefully governed. It’s easy to build the process but you need Dragons with real fire in their bellies to make it a success. Don’t be fooled by Fluffy Dragons!